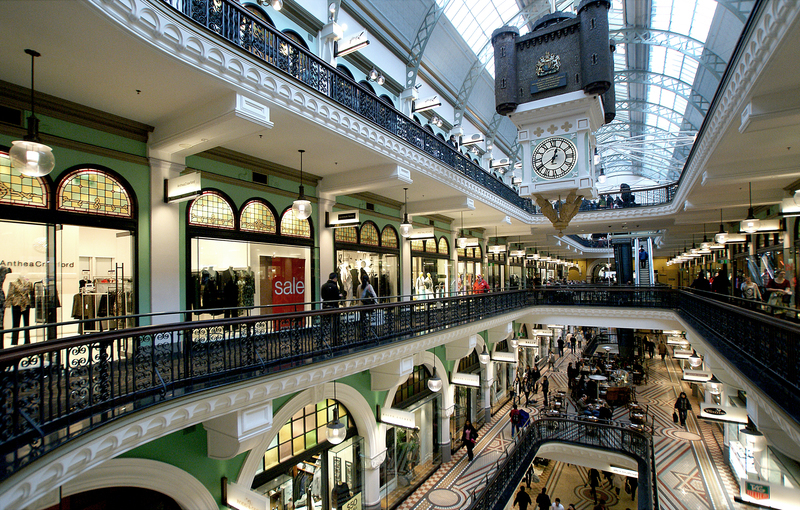 Many people visiting Sydney take the opportunity to take advantage of the great shopping that the city has to offer. Sydney has absolutely everything from chic designer shops, to modern air-conditioned malls, to exciting markets selling about just everything under the sun. In this article, we focus on the great shops in and around the CBD of Sydney and where you can find the best bargains. Shopping can be an arduous task, so why not take the strain out of it by leaving your transport to Sydney Executive Coach Charter. Our small group minibus charter is an ideal way for you and your friends to get around and bring your shopping safely home. There is no other way of saying this than the Queen Victoria Building is architecturally a splendid masterpiece. In fact, the building occupies an entire block of George Street and inside is one hundred and eighty superb retail outlets. The building was built in the 1980’s and you can find jewelry shops, homeware, and top fashion boutiques with big label names. It is one of the most prestigious places to shop in Sydney and has some delightful cafes and eateries. If you are looking for style and design then The Strand Arcade is the very place to go. The Arcade was named after the famous shopping street in London, and it mimic’s its namesake by offering designer labels, beauty salons, and expensive jewelry. It was the last of the great arcades built in Sydney, and remains an oasis from the hustle and bustle of the CBD. Many shoppers take advantage of the great coffee shops to take a rest and enjoy some fine coffee. There are many Sydney institutions that trade in the Strand such as, John Azzi Hair, Strand Hatters, The Nut Shop, and Elie’s Leather Repair. These shops stand alongside Australian designer fashion and a host of specialty stores. Right in the heart of the CBD in Sydney is the Pitt Street Mall, and since it opened its doors it is the most cosmopolitan and busy shopping precinct in Australia. It boasts 600 stores that sell almost everything that you can think of. David Jones, and Myer can be found at Pitt Street, but it also sells a variety of goods that will fit any style or budget. These are just some of the great shopping areas that the CBD has to offer, also within two blocks you can find Sydney Arcade, Westfield Sydney, Glasshouse, and Mid-City Shopping Centre. If any of these exciting shopping areas attract you enough to take a shopping expedition, then contact us today to arrange your transport. And then you do not have to consider lugging all your bags around on public transport and the crowded rush hour.